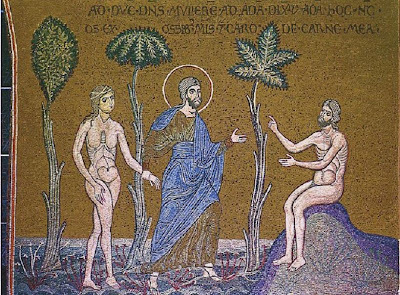 On this Sunday the Holy Church focuses on the memory of the exile of our ancestral parents from paradise for disobedience and intemperance in order that through misfortune it more evidently emphasizes the importance of the presented ascetical effort for all, and in the loss of the blessedness of paradise it specifies a subject, worthy of repentance and tears. The example of the ancestral parents shows us the whole weight of sin and its fatal consequences and teaches us to avoid intemperance as the beginning and the source of sin, and to turn to repentance, as to the unique means of deliverance from the anger and judgment of God. 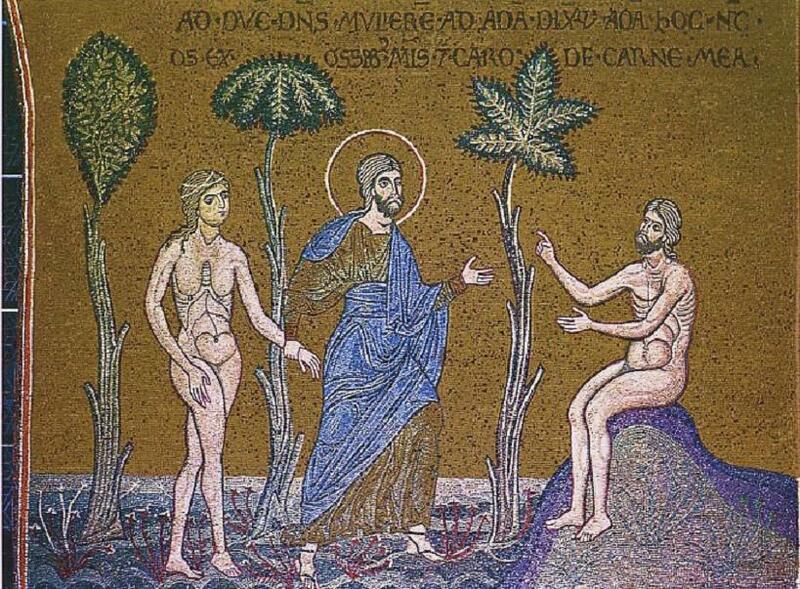 "Adam was cast out", sings the Holy Church on this day, "from the sweetness of paradise, when with bitter desire he broke the commandment of the Master, and he was condemned to work the earth from which he himself had been taken, and then to eat his bread with much toil; therefore let us love abstinence, that we may not weep outside of paradise as he did, but enter into it"; "Let us keep the fast offering tears, contrition and alms", "Let us still the passions of our soul, let us subdue the rebelliousness of the flesh"; "Girding ourselves for the good spiritual struggle of the fast" and "Taking up the armor of the cross, let us fight the enemy, having faith as an invincible wall, and prayer as a breastplate, and alms as a helmet, and fasting as a sword, which cuts away all evil from our heart"; "Let us brightly begin the season of fasting preparing ourselves for the spiritual struggle"; "Now is the favorable time, now is the season of repentance, let us cut off the works of darkness, and clothe ourselves in the armor of light: that having sailed across the great expanse of the Fast, we may reach the three-day Resurrection of our Lord and Savior Jesus Christ, the Savior of our souls". With this tender, touching voice the Holy Church calls us as her children from the present day to forget everything that up to now occupied our thoughts and feelings and distracted them from "the one thing needful"; to reject everything from itself that serviced temptation and occasion for sin, that raised in us impure thoughts and feelings, that originated in us sinful desires and currents; to postpone for a while even our ordinary affairs and occupations, in so far as they soon distract our thoughts from a reverent deepening in our very selves, they irritate our heart with feelings of anger and envy, dreams of ambition and covetousness; to make itself thirsty for long prayerful vigils, fervent prayers and prostrations; to ignite in oneself an unshakable desire, voluntarily and vigilantly, thanking and glorifying the Lord to now enter the opening door of the saving fast, repentance and spiritual renewal; to kindle in itself a firm determination to pass the holy days of the fast fervently, reverently and joyfully. In the gospel and epistle readings, the Holy Church presents its final teachings about the spiritual efforts of the actual fast. The Fast should begin with the forgiveness by the people of their trespasses and their rejection of the deeds of darkness consisting of an unfeigned fulfillment of the rules of keeping the fast and not to judge their neighbor. Reconcilement with all, the pardon and remission of all our transgressions, is the first, main and necessary condition of our reconcilement with God, cleansing and correcting our sins. Without this reconcilement with all, without this putting an end to mutual conflicts and enmity among us, it is impossible to draw near to the Lord. It is impossible even to begin the holy journey to Lent and repentance. From here came a custom of Orthodox Christians to ask each other forgiveness, and is the same as when they to go to the graves of the dead for this purpose and is why the day is called in popular speech forgiveness and farewell. It is self understood, that not only with our mouth, but also mainly with our heart we should utter a full, complete forgiveness not only for something which insults us, but also for all that is hateful and offends us, all that condemns and curses us, all that makes every evil for us. We should try to bow with true - Christian humility for reconciliation and for which the devil, according to his evil and slander, had the misfortune to offend us in word and deed. Saint John Chrysostom teaches: "We should not forgive one another only by words, but with a pure heart so that our memory of the evil will not turn the sword against us. Our having been offended will not cause us evil as much as we cause ourselves, feeding the anger in ourselves and exposing ourselves to condemnation by God for that. If we love those who offend us, then evil will be turned on its very head, and it will continue to suffer severely; but if we will be indignant, then we shall continue to suffer all the same even in spite of ourselves." O Master, Guide to wisdom, Giver of counsel, Instructor of the foolish and Defender of the poor: strengthen and enlighten my heart. O Word of the Father, grant me the words, for I will not restrain my mouth from crying to Thee: Have mercy on me, the fallen, O merciful One. On this day, on the eve of the Holy Forty day Fast, ancient Christians, the inhabitants of monasteries, having done the evening service, and having venerated all the monastic holy things and having been comforted by the general evening meal, solemnly performed the rite of mutual forgiveness, and then left the for the desert (pustin) to keep silence and fast in deep solitude, to pray and repent and cry for those who sinned for all the past time. From that time on even until now there were also old customs honorably observed in some especially devout old cities and places of Holy Russia, for example, in Moscow and others. There pious Orthodox, on this day of Forgiveness, go to monasteries, to ancient cathedrals; they venerate the holy relics and especially those of the most revered saints; they come to receive the blessing from the bishops, the people present in the churches, the pious monks; they visit the homes of relatives and acquaintances, everywhere asking all for forgiveness and blessings; as a sign of mutual peace, forgiveness and concord, they give each other special breads which are prepared for this day, like the special kulich on Holy Pascha. And in the monasteries, cathedrals, as well as in all churches, the solemn Rite of Mutual Forgiveness is performed everywhere. In monasteries it is not always done and not everywhere in the churches, but after the Vesper Service is completed the farewell meal is served in the refectory, and after the Little Compline is read in the same refectory. 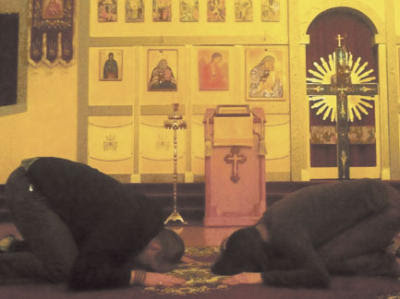 During the Forgiveness Rite in some monasteries, cathedrals and churches the irmoi of the Canon of Repentance: "A helper and protector he is for me unto salvation", is sung, reminding all and everyone, that all of us are "sinners, transgressors, unrighteous" before our God, "lower than the keepers of the fast, lower than the creator, as He commanded" us. And in some places, according to local custom, during the Rite of Mutual Forgiveness they sing the stichera of Pascha with their refrains: "Today a sacred Pascha is revealed to us"; is sung not without purpose, reminding us, and on this day as on the Day of Resurrection, "Let us embrace each other, let us call 'brothers' even those that hate us and forgive all" and everything for the sake of our fasting for the sake of the suffering and the resurrection of Christ. It is truly and deeply a shame, that these good ancient customs disappear; that they so disappear in some places, in some circles there isn't a trace of them. They avoid the temple of God on this day and evening, they do not even glance at it, but will gather amusements in their apartments; there they betray themselves to satisfaction of any sort, an excess of stimulating pleasures, and so forth and so forth. It means that the people eat meat for the last time before Lent. For what, in what consideration do they eat meat for the last time before Lent? For this do they eat meat, in order to fast and pray tomorrow and the day after, to repent and cry for their sins? Nothing like this happened. They eat meat for the last time before Lent for its own sake of eating meat for the last time only on this holy Christian day and especially the night before the Holy Forty Day Fast to carry on in a pagan way as it may be noisier and more cheerful. Of the ancient customs of our Christ loving fathers there is in some circles only one that is pagan. Suppressed by pagan customs, the word "eating meat for the last time" has lost its primitive Christian meaning. "Eating flesh for the last time" is "the beginning of fasting"; and in our pagan times it has degenerated to meaning the strengthened satiation of any kind. And after the night spent in a pagan way eating flesh for the last time, growing dull from sleeplessness, and the eyes see exhaustion from satiation, at last, "it is the flickering morning of Holy Great Lent. Fatigue after a whole night of crashing music, simple speech, often off-color speech, noise and pounding ears resound at daybreak by the mournful toll of the Lenten bell inviting one to Morning Prayer of repentance. What more is there to do? Aging feet drag along a fragile heavy body, and dulled senses drags a soul which is exhausted from oppressing impressions not from the morning prayer of repentance for which it did not even consider, but in the heavy embraces, not refreshing, not encouraging, but sleeps an even more depressing sinful soul..." (See the details in The Instructions of Nicanor, Archbishop of Chersonese, Vol. 1, page 281). So we have changes all this century! So almost all the canons and Christian customs have weakened in our time! The duty of the pastors of the Church is to inspire the flock that they "were not conformed to this age" (Rom. 12:2), "but stand in their faith" (1 Cor. 16:1), "hold to the tradition" (2 Thess. 2:15), in the glory of God, for the benefit of one's neighbor and for the salvation of one's soul, observe the pious customs and Christian rules to which our good and devout ancestors followed.